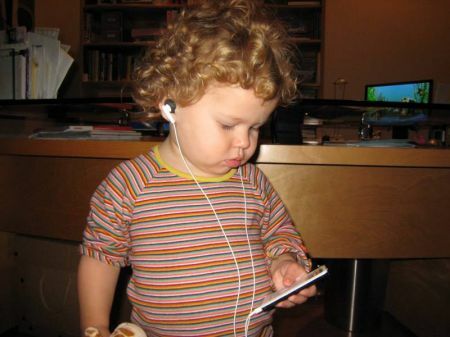 So gadgets will be intertwined with this generation of kids. What better time to start Mara off with a gadget than now at 21 months? We chose to start with an ipod. Mom says that she really likes it. I don’t know, I don’t hear anything. There are two more pics of her when you click through. Go-Go Gadget Girl! My heart dropped! You’re soooo brave…I tend to freak when anyone comes around my gadgets….electronic or not! ;) Let me know when she’s typing, filing and downloading tunes!…does this mean mommy’s gettin’ a new ipod for Christmas?